Join Passive House Canada in the Vancouver Economic Commission’s beautiful presentation centre for a presentation and dialogue on the economic impact of the BC Energy Step Code and Vancouver’s Zero Emission Building Bylaw. VEC’s 2019 “Green Buildings Market Forecast” for Metro Vancouver has shown that these green building policies are producing a market for green building products worth $3.3 billion by 2032. Come learn about what this means for BC manufacturers and installers and discuss where we all need to go next. This session is seeking accreditation with PHI, AIBC, and BC Housing. This event is brought to you by Passive House Canada, in partnership with ZEBx. 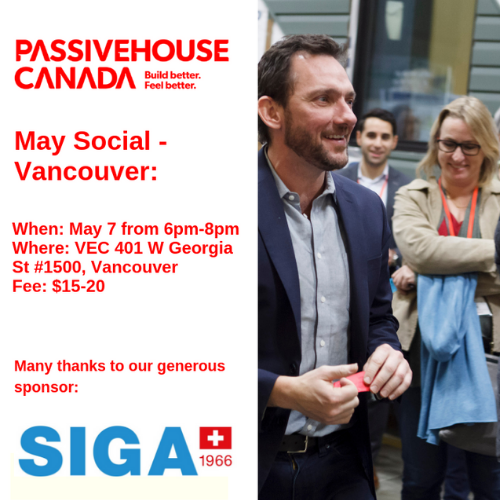 All Passive House Socials are primarily sponsored by SIGA Cover.